Join us as Burning Sky take over the taps at Tate Modern. A brewery that draws parallels between English and Belgian brewing traditions, reinvigorating them for today’s tastes. Nestled in a small village at the foot of the South Downs they are mindful of our community, drawing inspiration, solace and foraged ingredients from the surrounding countryside. 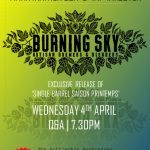 This exciting Tate Tap Takeover will see Burning Sky’s punchy hop forward pales and seasonal brews paired with food. Visit the Tate website for more information and tickets.